Itching And Cracking Feet? Help Is Here! Athlete’s foot, or tinea pedis, is a fungal infection that occurs through a small break in the skin. The skin becomes red and itchy and may also present with drainage and an odor. There are several over-the-counter creams which will cure the athlete’s foot if it is on the sole of the foot, however they must be used beyond the time the symptoms disappear. 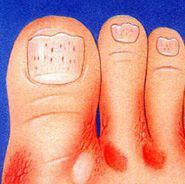 If the athlete’s foot occurs between the toes, it is likely a mixed infection with both fungus and bacteria contributing. If left untreated, the contagious fungus will spread to other places on your foot. It will cause a toenail fungus infection to form and can spread to other family members. It is important that you visit Dr. Schneider to have this examined to decide what prescription medication would be best for you.